Welcome to Team Stryker! Soon to be the world’s greatest online comic! My name is Andrew Grieve and I would like to personally welcome everyone to the world of Team Stryker! What started off as a game concept while me and my friends attended art school has now blossomed into the comic you see before you. Each member of Team Stryker is (very, very loosely) inspired by my closest friends. Unlike most ongoing web comics Team Stryker is broken down into issues or Missions with a distinct beginning, middle and end. 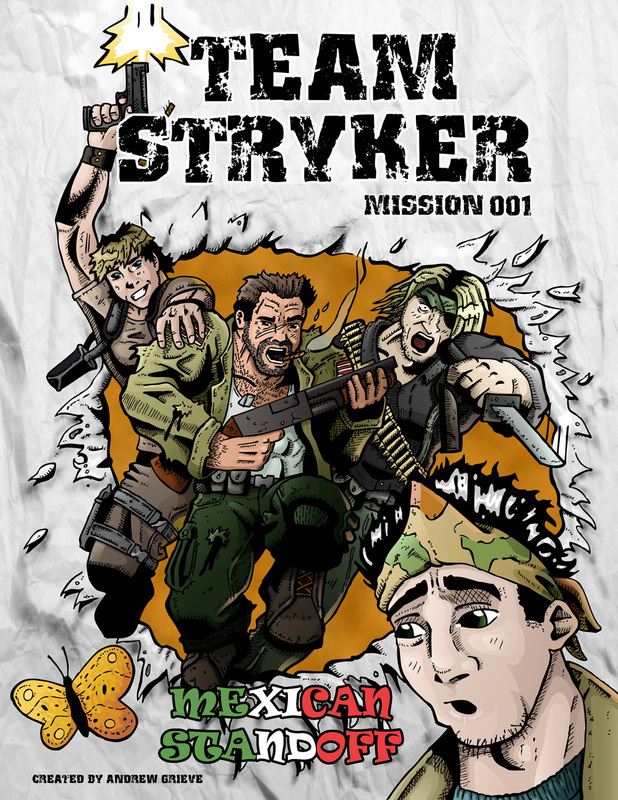 The first Mission of Team Stryker was drawn back in 2008 as a wedding gift when one of the members of Team Stryker got married. It was done in black and white and done on a very tight deadline. Encouraged by family and friends I went on to draw a second and a third Mission, both still in black and white. Now nearly 4 years later I have gone and “remastered” these issues in glorious high definition color! On this site I plan to post these Missions and many more to follow for the world to see and enjoy. I will post roughly a page a week with updates in between. My ultimate goal is to be able to do this for a career. Drawing has always been my greatest hobby and passion but I have never been so inspired as when I drew the first page of Team Stryker Mission 001 Page 01. Since that day it has been the only career choice that makes sense for me and I plan on working hard every day to make that dream a reality. So today I proudly welcome every single person that stumbles across this page an honorary member of Team Stryker! It’s a shame you don’t have a donate button! I’d certainly donate to this brilliant blog! I guess for now i’ll settle for bookmarking and adding your RSS feed to my Google account. I look forward to fresh updates and will share this website with my Facebook group. Chat soon!